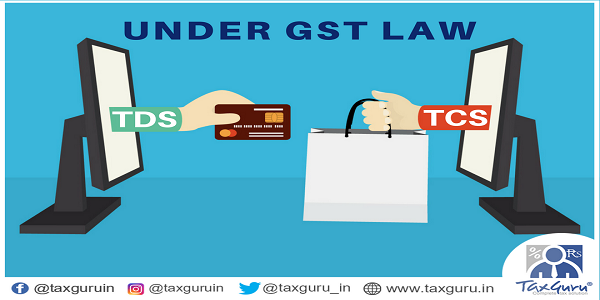 Article explains Provisions of TDS And TCS Under GST Law which includes Threshold limit of TDS deduction, Registration of GST TDS / TCS deductors, Rate of TDS / TCS under GST, Payment of TDS / TCS under GST, TDS / TCS Certificate under GST, TDS / TCS credit under GST, Delay in deposit of TDS / TCS under GST , Refund of TDS / TCS under GST, Postponement of TDS / TCS provision under GST, Time Period for TCS / TDS Payment, Manner of TDS / TCS Payment under GST, Monthly / Annual TCS Statement etc. The concept of TDS is familiar term under Income-Tax law, which means Tax deduction at source. TDS is an advance tax is being collected by the principal agent or employer under different sections of the Income-Tax Act. After collection of TDS, the deductor makes payment to the Government in every quarter. Similarly, the concept of TCS was available in the Sates VAT laws. TCS was levied and collected on sale value of the certain commodities as notified by the State tax authority.GST law makers have incorporated the both concept of TDS and TCS under GST law to track the business transaction and generate revenue. As per section 51 of the CGST Act, tax at source is required to be deducted by the Government departments from the payment made or credited to the supplier in specified situations of supply of goods and services or both. The supplier of such cases takes into account the amount so deducted and makes the balance payment of tax to the government. The tax would be deducted @1% of the payment made to the supplier (the deductee) of taxable goods or services or both, where the total value of such supply, under a contract, exceeds two lakh fifty thousand rupees (excluding the amount of Central tax, State tax, Union Territory tax, Integrated tax and cess indicated in the invoice). Thus, individual supplies may be less than Rs. 2,50,000/-, but if contract value is more than Rs. 2,50,000/-, TDS will have to be deducted. However, no deduction shall be made if the location of the supplier and the place of supply is in a State or Union territory, which is different from the State, or as the case may be, Union Territory of registration of the recipient. A TDS deductor has to compulsorily register without any threshold limit. The deductor has a privilege of obtaining registration under GST without requiring PAN. He can obtain registration using his Tax Deduction and Collection Account Number (TAN) issued under the Income-Tax Act, 1961. (d) Such person or category of persons as may be notified by Central or State Governments on the recommendation of the GST Council. According to section 51(1) of the CGST Act, tax @ 1% would be required to be deducted and deposited from the payments made or credited to the supplier of taxable goods and services as may be notified by the Central or State Governments on the recommendation of GST Council. As per Section 51(2) of the CGST Act, the amount of tax so deducted is required to be deposited to the credit of appropriate Government (Central Government for CGST and IGST, State Government for SGST) account within 10 days after the end of month in which such deduction was made. According to Section 51 (4) of the CGST Act, a certificate is required to be issued by deductor to deductee within 5 days of deposit of tax by deductor to the respective Government account. (d) Amount paid to the appropriate government. As per section 51(4) of the CGST Act, if any deductor fails to issue the certificate within time- limit of 5 days of deposit of tax, he shall be liable to pay late fee of Rs. 100/- per day for the period starting from the expiry of 5 days period until it is issued to deductee. However, the maximum late fee will be restricted to Rs.5,000/-. As per section 51(5) of the CGST Act, the deductee will take the credit of TDS deducted from his payments on the basis of TDS certificate. The deductee will claim the credit in his electronic cash ledger, of the tax deducted and reflected in the return of the deductor filed for the transaction period. According to section 51 (6) , if any deductor fails to pay the Government the amount so collected as TDS within 10 days of following month, he will be liable to pay interest in addition to the amount tax deducted , interest for the period starting from the due date of deposit till the final date of deposit of TDS amount. The applicability of TDS provision has been postponed for implementation till 30’th September’2018. Section 52 of the CGST Act, 2017 has specified the provision for collection of tax at source. Tax Collection at Source (TCS) has similarities with TDS, as well as a few distinctive features. TDS refers to the tax which is deducted when the recipient of goods or services makes some payments under a contract etc. while TCS refers to the tax which is collected by the electronic commerce operator when a supplier supplies some goods or services through its portal and the payment for that supply is collected by the electronic commerce operator. Section 2 (45) of the CGST Act, defines “Electronic Commerce Operator’ means any person who owns, operates or manages digital or electronic facility or platform for electronic commerce. Section 2(44) of the CGST Act, defines ‘Electronic Commerce’ means the supply of goods or services or both, including digital products over digital or electronic network. The goods or services belonging to other suppliers are displayed on the portals of the operators and consumers buy such goods/services through these portals. On placing the order for a particular product/service, the actual supplier supplies the selected product/service to the consumer. The price/consideration for the product/ service is collected by the operator from the consumer and passed on to the actual supplier after the deduction of commission by the operator. Every electronic commerce operator, not being an agent, shall collect an amount calculated at the rate of 1% of the net value of taxable supplies made through it where the consideration with respect to such supplies is to be collected by the operator and pay to the Government. Net value has to be ascertained in terms of a formula as provided under sub-section (1) of Section 52 of the Act. Example: Suppose a certain product is sold at Rs. 1000/- through an Operator by a seller. The Operator would deduct tax @ 1% of the net value of Rs. 1000/- i.e. Rs. 10/-. The said amount will be calculated on the net value of the goods/services supplied through the portal of the operator. For the purposes of considering the “net value of taxable supplies” shall mean the aggregate value of taxable supplies of goods or services, other than services notified under sub-section (4) of section 8 of the CGST Act, made during any month by all registered taxable persons through the operator reduced by the aggregate value of taxable supplies returned to the suppliers during the said month. 1. Registration: The e-commerce operator as well as the supplier supplying goods or services through an operator needs to compulsorily register under The threshold limit of Rs. 20 lakhs (Rs. 10 lakhs for special category states) is not applicable to them. Section 24(x) of the CGST Act, 2017 makes it mandatory for every e-commerce operator to get registered under GST. Similarly, section 24(ix) of the CGST Act, 2017 makes it mandatory for every person who supplies goods/services through an operator to get registered under GST. Section 52 (2) of the CGST Act, empowered electronic commerce operator to collect the amount shall be without prejudice to any other mode of recovery from the operator. Sub-section (3) of Section 52 of the Act provides that Tax Collected at Source shall be paid to the Government within 10 days after the end of the month of collection. Any amount Collects as TCS shall be paid by debiting the e-cash ledger and electronic liability register shall be credited accordingly. a. Outward supplies of Goods and Services. b. Returned of goods and services. c. Amount collected during a month. In Form GSTR-8 within 10 days from the end of the month in terms of sub-rule (1) of Rule 67 of the rules read with sub-section (4) of Section 52 of the CGST Act. c. Amount collected during a financial year. In Form GSTR-9B by 31’st December following the end of such Financial Year in terms of sub-section (5) of section 52 of the CGST Act, and read with sub-rule (2) of Rule 80 of the CGST Rules. If any e.commerce operator who collects the amount under section 52(1) of the Act, after furnishing a statement found any errors or omissions or incorrect particulars therein, other than as a result of scrutiny, audit, inspection or enforcement activity by the tax authorities then he shall rectify the same in the statement of month of such discovery, subject to Payment of interest under sub-section (6) of Section 52 of the Act. After the due date of furnishing the statement for the month of September following the end of Financial Year, or Actual date of Furnishing the Annual Statement, whichever is earlier. Supplier of goods and services can claim the amount of credit in their e-Cash Ledger as collected and reflected by the e.commerce Operator in Statement under sub-section (7) of Section 52 of the Act. The Supplies shall match with the corresponding outward supplies of the registered Supplier as the details furnished by the e.commerce operator in Form GSTR-8 shall be made available electronically to each of the suppliers in Part C of Form GSTR -2A on the Common Portal after the due date of filing of Form GSTR-8 in terms of Rule (2) of Rule 67 read with sub-section (8) of Section 52 of the Act. When the Supplies under sub-section (4) do not match with the corresponding supplies of the supplier then, such discrepancy shall be communicated to both the persons in terms of sub-section (9) of Section 52 of the Act. The amount in respect of which any discrepancy in the value of such supplies, the same would be communicated to both of the under sub-section (9) of Section 52 of the Act. If such discrepancy in value is not rectified within the given time, then such amount would be added to the output tax liability of such suppler. The supplier will have to pay the differential amount of output tax along with interest in terms of sub-section (10) & sub-section (11) of section 52 of the Act. An officer not below the rank of Deputy Commissioner can issue Notice to supplied through electronic commerce operator during any period, stock of goods lying in warehouses/godowns etc., managed by such operator and declared as additional places of business by such supplies. The electronic commerce operator is required to furnish such details within 15 working days of serve of such notice under sub-section (13) of Section 52 of the Act. The applicability of TCS provision has been postponed for implementation till 30’th September’2108. Conclusion: It is pertinent to mention that even though the provision of TDS and TCS has been incorporated under GST law but the implementation of the said provision has been postponed by the Government from time to time due to several reasons of technical issues. Finally, the decision of the GST Council as well as the Government is being awaited for implementation of provision of TDS and TCS with effect from 1’st October’2018. with respect to sales return from the sales made through the e commerce platform (in the same month), what will be the procedure to get back tcs deducted by e commerce operator.